Creating dynamic interpersonal activities in an environment conducive for personal growth, wellness, and excellence. An interactive opportunity to continue my dedication in helping others to achieve wellness through the integration of practice, knowledge and embodiment. Full commitment to advancing the healing arts and spiritual practice. 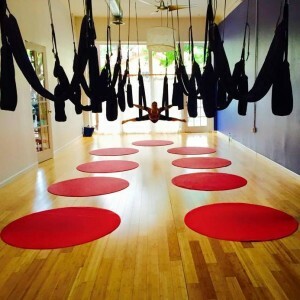 Jen Healy brings a dynamic blend of yoga, dance, and movement to Aerial Yoga Play that allows full self-expression, release of limitations, and openness that is fun, playful, powerful, and healing as well as steeped with profound teachings and practical knowledge. Dedicated to advancing the healing arts, with over 15 years of experience and excellence, she has extensive knowledge and understanding of structure, anatomy, energy flow, and alignment. She has been an experienced dancer, athlete, yogini, and natural arcobat all her life which has inspired her to create a new paradigm in exercise and yoga therapy. Combining her training with her passion for embodied movement and sacred play, the vision of a “Quantum Playground” has been born, incorporating sacred geometry play structures with aerial yoga swings and monkey bars. A pioneer and revolutionary, Jen Healy has created a new wave of conscious movement to awaken the mind, body, and soul. 3/08-present IQUIM Quantum BiofeedbackTraining Los Angelos CA. Studied Quantum Biofeedback techniques for the EPFX to use electromagnetic frequency modulation to balance and align the energy systems of the mental, emotional, spiritual and physical bodies. Learned basic and intermediate techniques as well as advanced therapeutic applications. (150 hours). 6/01-8/05 Chi Nei Tsang Intensives, Levels I, II and Assistant Teaching Marin, CA. Studied internal organ massage with emphasis on the digestive system, chi kung, and the emotional body. Learned basic and intermediate techniques, advanced therapeutic applications, and teacher training (350 hours). 1/01-8/05 Traditional Thai Medical Massage Marin, CA. Studied privately with owner advanced Ancient Buddhist Temple Healing techniques of the southern style Thai massage (Wat Po), learning advanced therapeutic applications, energy healing, and teacher training (300 hours). Studied one-on-one with owner, learning advanced training techniques in Myofascial Release , Neuromuscular Therapy, Physical Therapy and Energy Healing for acute and chronic sports injuries, stress related traumas, and long term illnesses. Studied maximum level training offered in Nuad BoRarn ancient style Thai massage, learning basic and intermediate techniques, Sen-therapy, therapeutic applications, and teacher training (240hours). Studied Swedish, Sports and Deep Tissue therapeutic massage techniques under certified instructor. Focused on understanding anatomical structure of muscles/joints and nervous system, physical manipulation, and energy flow. Offering personalized therapeutic healing techniques aimed to reduce stress, promote health and body awareness, and improve athletic performance. Specializing in lower back injury, stomach problems, structural harmony, balancing the mind-body-spirit, advanced facial stress release, and energy work. Practicing Body Engineering and Energy Management healing techniques to relieve stress, increase structural integrity, and reduce chronic pain symptoms. Specializing in Ancient Thai healing, Chi Nei Tsang, Acupressure, Shiatsu, Deep Tissue, Sports, Reflexology, Chakra balancing and Energy work. Practicing Advanced body therapy massage techniques for healing purposes, to relieve stress and sports related injuries. Specializing in Ancient Thai healing, Chi Nei Tsang, Advanced Swedish, Shiatsu, Deep Tissue, Sports, Reflexology, Chakra balancing and Energy work. Practicing therapeutic massage techniques for healing purposes, to relieve stress and sports related injuries. Specializing in Swedish, Shiatsu, Deep Tissue, Sports, Reflexology and Energy work. Learning advanced training techniques in Myofascial Release , Neuromuscular Therapy, Physical Therapy and Energy Healing for acute and chronic sports injuries, stress related traumas, and long term illnesses. Practicing therapeutic massage techniques for healing purposes, to relieve stress and sports related injuries. Specializing in Swedish, Shiatsu, Deep Tissue, Sports, Acupressure, Chinese Medicine, Reflexology, Pregnancy and Energy work. Voted “Best Massage Therapist in the Bay Area” by Nob Hill Gazette, The Best of ’99. Trained and supervised all employees in techniques for improving sales performance. Telemarketing for major local and regional newspapers. Consistently top sales person for the five years of employment. Leaded in responsibility for customer service relations and quality control. Determined microfabrication processing steps for discontinued bipolar transistors through computer modeling and experimental data. Obtained simulated bipolar devices with Virtual Wafer Fab tools. Teaching assistant for third year electronics laboratory course. Presented and reviewed fundamentals of electronics, Assisted students in laboratory procedures, and responsible for grading all material. Tutored all levels of physics from the fundamentals through quantum mechanics. Tutored in basic electrical engineering courses such as statics, circuits, logic design, and electronics. 20 hours per week, with an average of 25 different students per semester. Consistently increased student performance and grades. Summer UNdergraduate FEllowship in Sensor Technologies. Studied MEMS processes and MUMPS technology in microfabrication laboratory. Fabricated and tested a “silicon lamp” for metabolism monitor project. Interests include cycling/biking, ultimate frisbee, climbing, hiking, dancing, music, yoga, meditation, holistic healing and alternative medicine. Enjoy vegetarian cooking, traveling, learning about different cultures and languages. Committed to mental, physical and spiritual growth through these activities. REFERENCES Academic, Professional, and Personal References Available Upon Request.